About two months ago, I wrote a few things about the Knicks and their excessive shooting from the perimeter. 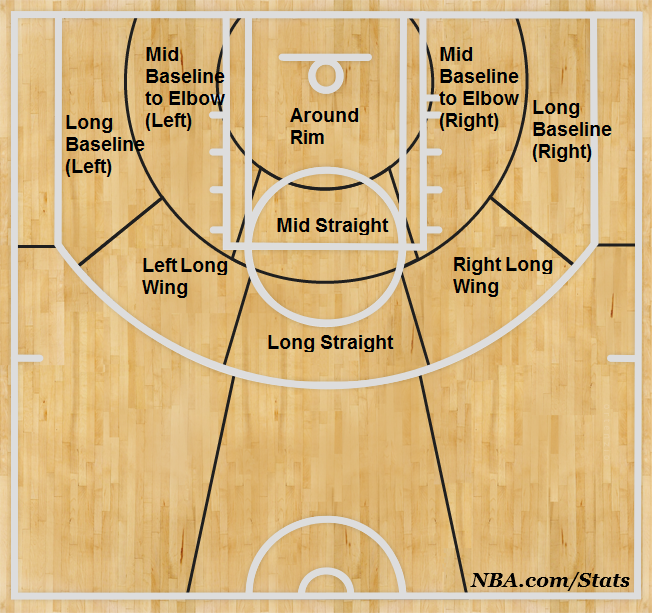 Part of what was looked at were game-by-game shot locations for teams from NBA.com, but ever since writing that post there wasn’t a whole lot of usefulness with a season’s worth of shot location logging when it came to presenting it. With the season concluding last night, however, I decided to release the entire document in this post. 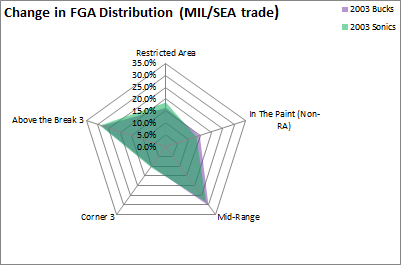 Along with that, I made three tables to highlight some of the best and worst performances by teams from each of the five spots on the floor: restricted area, paint non-restricted area, mid-range, corner three, and the above the break three. Unfortunately, I never tracked free throws. Maybe next season. 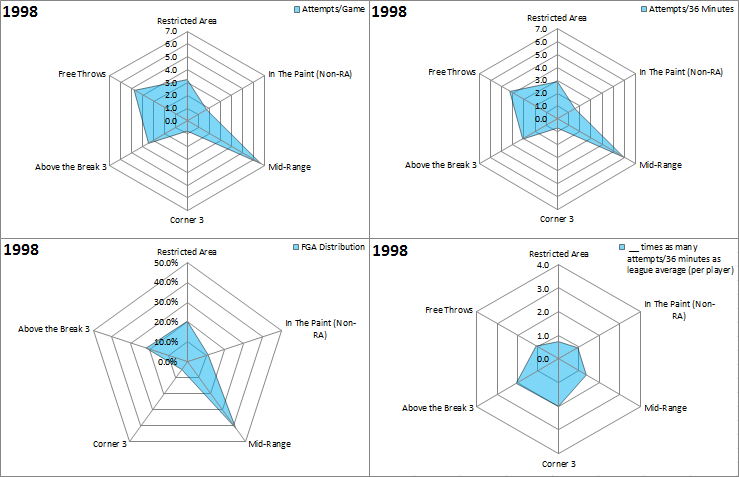 The three separate tables include the top 10 games with the most and least field goals made from each spot, most and least field goals attempted, and the hottest and coldest performances from each shot location. (Scroll a little further down in each table for the least/coldest shooting games.) For some categories with ties, I included a few extra games just because. 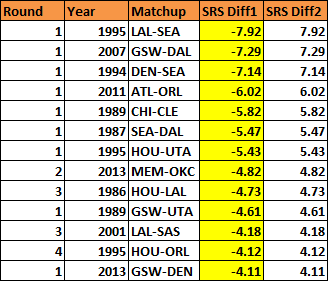 Some teams will dominate certain categories, for better or for worse, like how some may expect Houston to make a joke of the least mid-range field goals attempted. For every table I’ll also include some notes, something like a tl;dr section. 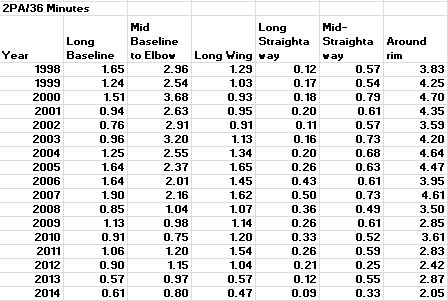 Anyway, the first table is the most/least field goals made from each location. You can toggle through each location with links to them at the bottom of each table. 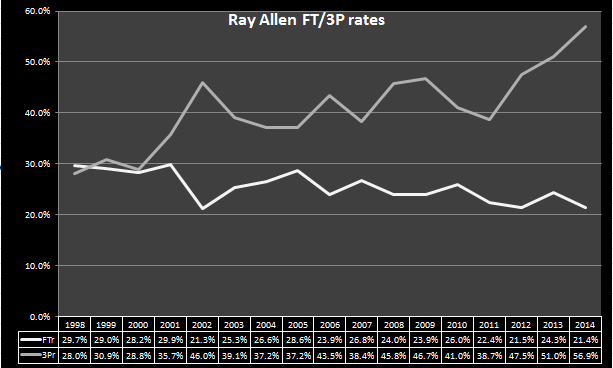 Again, for the entire document, this link should do the trick along with sheets detailing percentage of attempts outside the paint and percentage of attempts in high-efficiency spots versus dead zones. Restricted Area: Not surprisingly, the Los Angeles Lakers got fried around the rim while the opposite can be said for the Pacers. All of the latter’s appearances in the least attempts around the rim came before the all-star break, but it shows just how suffocating they’ve been when clicking 100 percent. 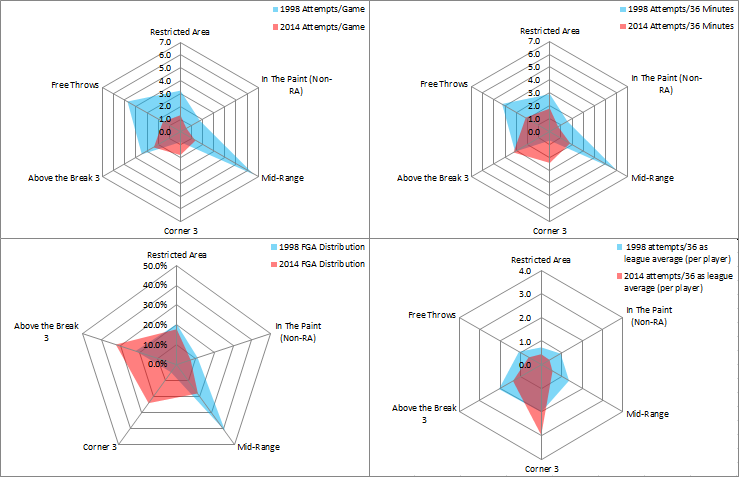 Paint Non-RA: A good mix of teams and opponents for the most makes. Another not-so-surprising stat is how many games played out where a team was scoreless from this location: well over 40. Mid-Range: The teams that shoot a ton from this location (Portland, New York, Orlando) make the list for most field goals made, Portland being at the top thanks to a 26-for-49 outing against non other than a team like Indiana. Houston and Detroit, the former neglecting this location while the other can’t space the floor all that well, fill up over half the slots for the least field goals made. Corner 3: A mix of teams and opponents for both categories. 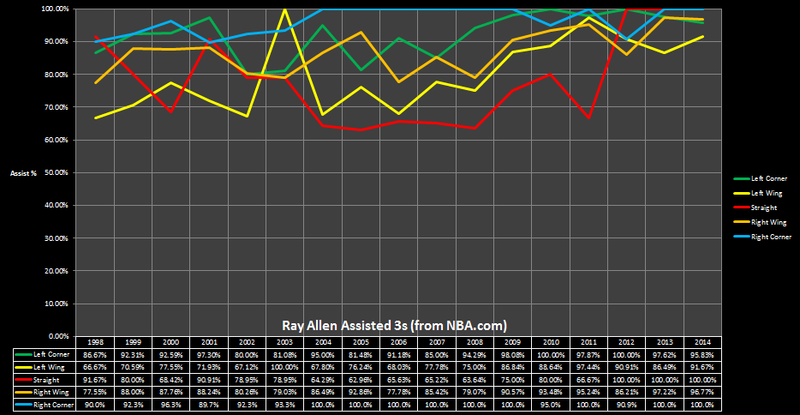 A lot of struggling defenses gave up the most threes from the corner, however. Washington is the only team to make 10 in one game with Milwaukee being the casualty. Above the break 3: Another variety of teams. Minnesota, one of the most frustrating teams from beyond the arc (in my opinion), actually makes the top 10 twice. More of the typical struggling teams from the perimeter crack the bottom 10: Memphis, Philadelphia, Detroit, Utah. Memphis is the only team to make no above the break threes in a game. Their opponent? Chicago. Restricted Area: Detroit, a team that feasts around the rim, naturally is featured here. Philadelphia and Houston unsurprisingly crack the top 10 as well. The results for the bottom 10 may or may not be expected as well. Teams like Brooklyn, Boston, and New York make that list. 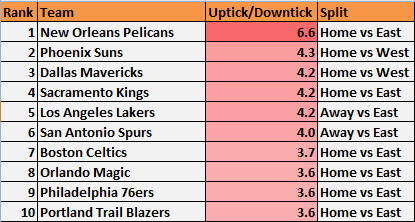 Sacramento has the lowest attempts with 8. Crazy. That’s 45 less attempts than the leading Detroit. 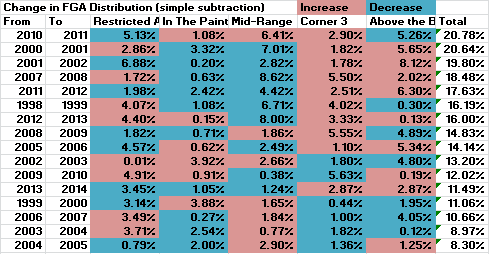 Paint-Non RA: A mix of good defenses allowing the most attempts and bad ones allowing the least from this location. The Kings are a surprise in the top 10, however, making the list as an opponent three times. Some good and struggling offenses make the bottom 10 in attempts with Miami and New York each making it twice and Chicago once. Mid-Range: Houston makes a joke of the bottom 10 attempts in a game. There’s a wider variety in the top 10 but Portland, Boston, and Washington unsurprisingly are featured. Indiana and Chicago account for half the opponents in that top 10. Corner 3: Some brutal defenses make up the opponents in the top 10 with a mix of solid offenses as the ones teeing off from the corners. The opposite can be said for the bottom 10. Yeesh. 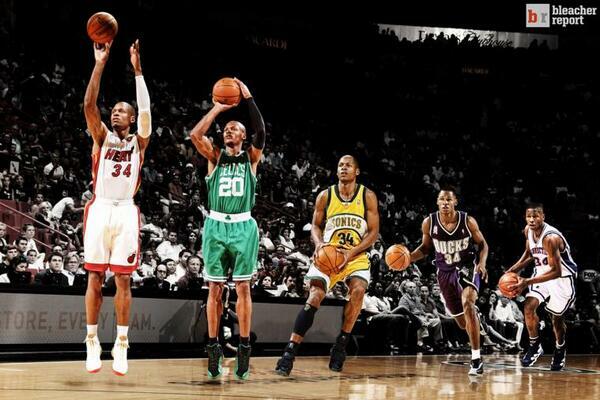 14 times has a team attempted no threes from the corner. Some good defenses and ones that struggle but do take away the corner (Portland) are the opponents during those games. Above the break 3: A bunch of games that went into overtime make up the top along with a lot of solid teams and…Philadelphia. At the bottom, New Orleans and Memphis make up 2/3 of it with the latter shooting the least amount of threes from above the break with 3. Sigh. Restricted Area: Oklahoma City makes the top 10 multiple times, but Miami is absent despite their trio of LeBron James, Dwyane Wade, and Chris Bosh all feasting from that location. A few of the struggling offenses make up the bottom, as usual. No team missed 75 percent of their attempts, however, so there’s that. Paint Non-RA: Tons of scoreless outings from this spot on the floor with the hottest shooting coming from less than 10 attempts. Dallas, Chicago, and New York are the only ones to shoot perfectly. 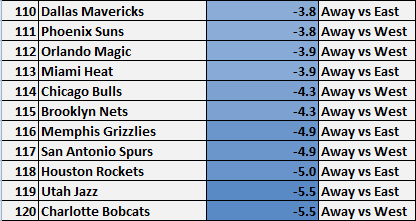 Mid-Range: Quite a few brutal nights, with New York’s Knicksy performance at Milwaukee probably being the worst. Brooklyn, with all the decent shooting they have, holds the worst park percentage-wise, however, at 19 percent on 4-for-21 shooting. Ouchies! Corner 3: Lots of perfection here with New York’s KNICKSY game at Milwaukee topping all others. The worst outings come against a mix of both good and bad defenses. Not surprising, though, with how only a handful attempts or so available each game. Above the Break 3: Indiana and Chicago each allowed a couple of the best shooting nights, though against respectable teams in the Suns and Clippers, respectively. There have sadly been 13 scoreless games from this location with the usual struggling teams from the arc being featured. Utah holds the worst performance at 0-for-14 against Dallas from just over a week ago. But that’s it! A brief summary of each location. To explore the entire document and some other sheets I fooled around with from earlier posts, click here. Unfortunately, as someone not too experienced with Google Sheets, I can’t figure out a way to sort through columns. Any help would be appreciated since it’d be nice to let others sort their way through the document. Other than that, enjoy the break until the playoffs. As a reminder, all stats are according to NBA.com.